OK so the wording is wonky because it is a multiplayer card in a single player world but I think this could have a place in Oath ala Inferno Titan. 6/5 flying haste is a fast, evasive clock. It gets to protect itself once for free, very often this may equate to a free counter spell or better since there is a strong possibility you can turn your opponents STP onto their own thing. There are no hexproof dudes that I know of with both flying and haste outside of soulflayer if played with delve. Retargeting a tendrils cancels out 2 of them, so thats actually not a bad thing, raises the threshold 2 spells. 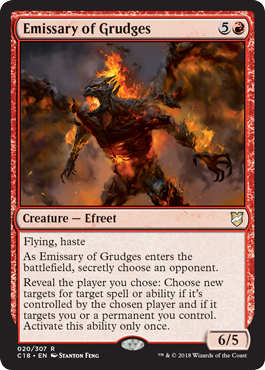 All I'm saying is that both Inferno Titan and carnage titans are contenders in oath, and who would have though that a few years ago knowing Emrakul and grizlebee are cards, so I think this could fit a niche for the list. retargetting a tendrils is not gaining control of it; the targetted copy just makes them gain 2 and lose 2, effectively countering that copy. Far be it for me to question Brian Kelly's ability to jam surprising creatures into an Oath shell... but, I'm seriously skeptical. This guy would have been great during the Spirit of the Night/Akroma, Angel of Wrath/Razia, Boros Archangel era of Oath decks. Effectively countering two copies - the copy you turned around, and the copy whose life loss / life gain will offset the one you turned around. It doesn't offset anything because you don't gain 2 life. If your trying to control the game, Grizzle is still a better thing to hit I think, but he can also fizzle if your are below 8 life. This has a lower barrier to entry and can be a faster clock. I think it'll be meta specific but I do think it has some legs. The haste is obviously clutch against an active Jace or Teferi, and the retargeting ability removes these planeswalkers as outs against your creature (assuming your opponent has creatures or Spirit tokens of their own). This resilience is most relevant when cheating the creature into play via Show and Tell rather than Oath: it’s always frustrating to Show a big creature T1 and then have it bounced by opponent’s T1 Jace. Not a bad card at all. It merits testing in the Stormbreath Dragon role.